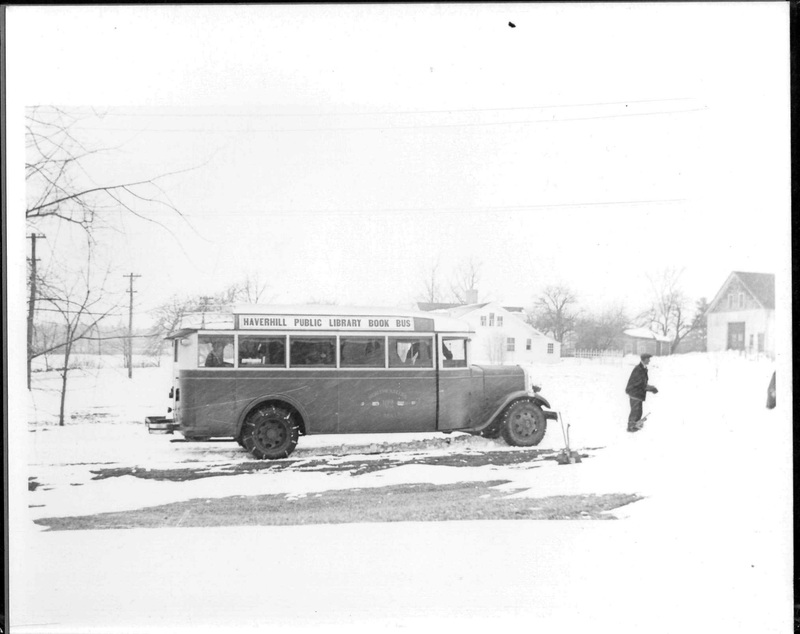 The bookmobile of Charlottetown, Prince Edward Island, circa 1937. Note the snow chains. Courtesy of the Public Archives and Records Office of Prince Edward Island, RG10/P-4. 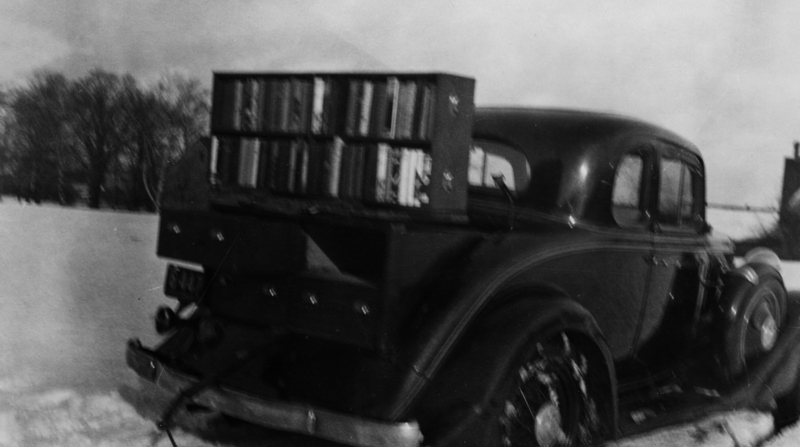 Vanderburg County, IN- A Ford Roadster with a box in the back that held 150 books and a shelf that folded down for a charging desk. Haines Falls, NY – Rented a mail truck by the hour, attaching bookshelves in the back. Ventrua, CA – used a Ford v8 pickup, building shelves on the back. Charlottetown, Prince Edward Island, Canada – Used a Chevy Coupe with a shelving unit for about 400 books that could be displayed out of the trunk. 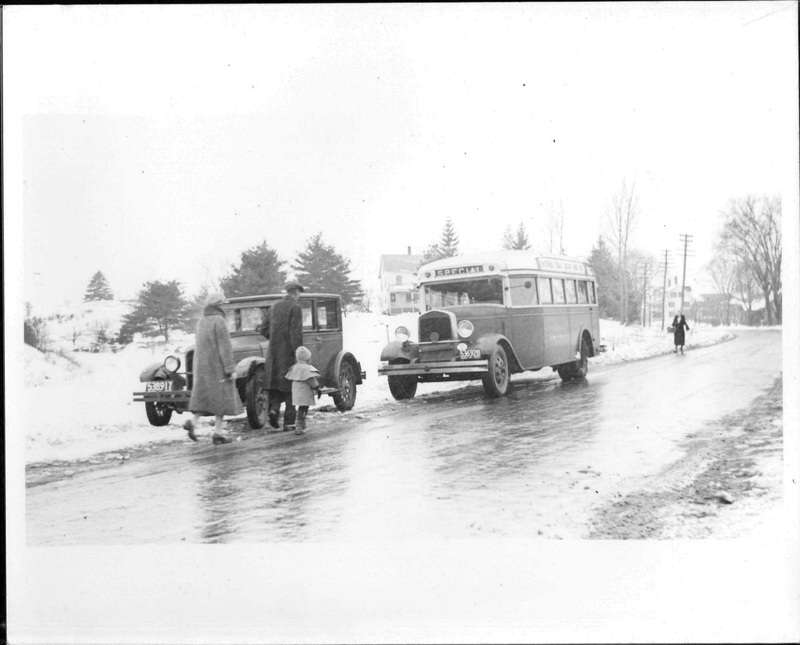 A heavier car was deemed impractical for the icy roads. Haverhill, Mass- Rented a passenger bus on a weekly basis, which included the driver. The bus company removed the seats and put in sloping wall shelves and a desk. It was set up so the equipment could easily be removed and converted back into a bus. Starting in 1932, the “book bus” went out every Wednesday and carried about 600 volumes. Patrons had the novel option of phoning the main library with requests to be brought out next time. Front and side views of the “book bus” of Haverhill, Mass. Courtesy of the Trustees of the Haverhill Public Library. This entry was posted in 1930s. Bookmark the permalink.